Spring ~ or break-up, anyway ~ is coming fast to Fairbanks. My studio is fragrant with the scent of green leaves and grasses, as I've been working on new embossed cuffs, pendants and earrings. The oils from the leaves, crushed as they pass through the rolling mill, evoke memories of warm sunshine, wildflowers and leafy branches against a blue sky. I hope you'll join me this week for 1st Friday at the Alaska Heritage House in Fairbanks. Not only will I have new jewelry to show for the first time, but this is a great opportunity to explore one of Fairbanks' most historic houses. Stop by anytime between 5 and 8 p.m. Friday, April 2. If you need directions, click here for a map. These are two of the new pieces I'll have at the show. The first, the Uchiwa Pendant, is part of the Forest Floor series. Uchiwa is a non-folding Japanese fan, very similar in shape to this pendant. 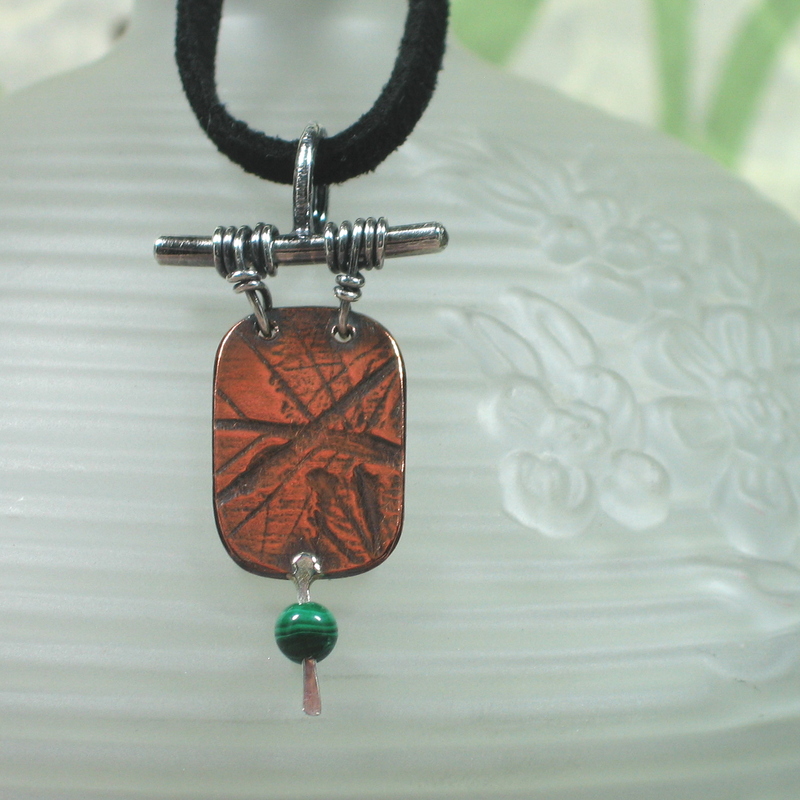 The copper shows the ribs of baneberry leaves and is accented by sterling silver and malachite. The second photo shows a chased copper lily brooch accented with sterling silver balls. Click on the photo to enlarge it so you can see the detail. The brooch was first cut freehand from a thin copper sheet and then worked on a sandbag into three-dimensional shape with dapping tools and hammers. It features a tie-tac type pin back rather than a traditional brooch finding; this way it can be worn on the lapel of a winter coat as well as on a sweater or blouse. Also for 1st Friday, please do stop by The Alaska House art gallery at 1003 Cushman Street. They've got a huge selection of my work in a beautiful display up front. With more than 60 pieces, there's a lot to see. Next time I take a break from the bench, later today or tomorrow, I'll post the photos illustrating how real leaves are embossed into metal for the Forest Floor jewelry. Is it possible to use your description and images for a post about Downtown First Fridays at downtownfairbanks.com? Kara, please do feel free to use the photos and information ~ publicity is a good thing! I'd just ask that the pics be credited to Tin Cup Designs. Thanks so much for your help in getting the word out! 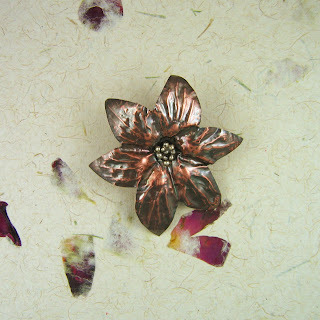 As a jewelry artist, I create chic, quirky, contemporary designs in sterling silver and copper. I am incredibly lucky to be able to do this work that I love in a place that I love: Two Rivers, Alaska. I share 10 acres of spruce woods with my husband and lots of critters, both wild and domestic, from lynxes to cockatiels. The angle of the light in the summertime, the aurora dancing across a glass-sharp sky... The bounty of berries and wildflowers and snowflakes and hoarfrost... All these things inspire me as I work. My jewelry makes people happy, and that delights me. Feel free to email me at kristin@tincupdesigns.com. ©2009-2010 Kristin L. Summerlin. All Rights Reserved.